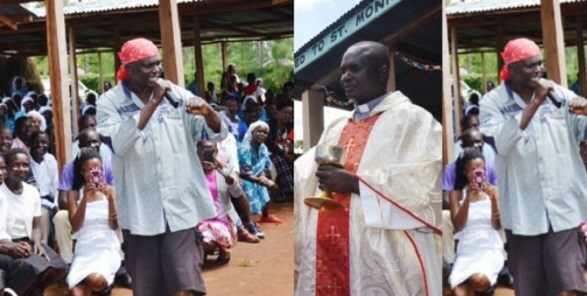 A Catholic Priest in Kenya identified as Father Paul Ogalo, has been suspended for rapping in church as a way of preaching the gospel. The 45-year-old Catholic Priest who is one of the Parishioner’s favorite Priest, had been entertaining his parishioners with rap music, urging them to stop using drugs and to get involved in environmental and social justice issues. Locals came to love his unique style of preaching the Gospel. “I’m very disappointed that he is suspended. I will now not go to church,” said Benard Oketch, 28. It was gathered that after celebrating Mass, the Catholic Priest would change his priestly vestments for black shorts and a white shirt, tie a red bandana around his head, and begin rapping to the congregation. Bishop Anyolo who spoke on Sunday, however stated that Fr Ogalo has not been barred from attending church services. “It is true the church has taken a disciplinary measure against him. He is suspended because the use of rap music in preaching is not allowed. “We have just stopped him from preaching using rap to accord him time to change his ways,” said Bishop Anyolo. The priest’s suspension has, however, elicited sharp reaction on social media. Mr Charles Mulama, a Facebook user, supported the church’s decision, saying rules should be obeyed. “Catholic Church is known to be conservative in its doctrines. The priest was wrong in introducing rap in prayer services,” posted Mr Mulama. Another Facebook user, Mr Otieno Otieno, said the church risks losing its young followers if it does not want to embrace change. “The church should just allow Father Massa to use rap to bring more followers. The youth listen well through rap because normal preaching is boring,” he posted.